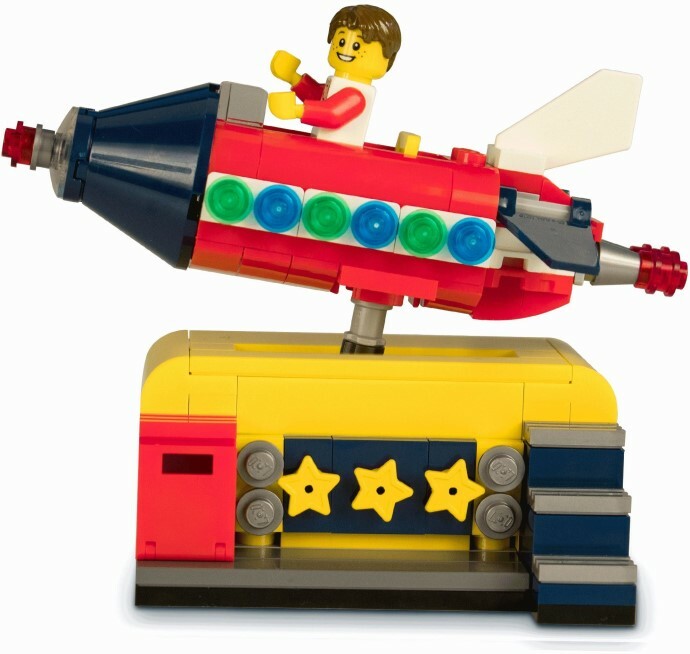 Promobricks has posted this picture of 40335 Space Rocket Ride on Instagram having obtained it in a certified LEGO store in Croatia. It's based on the winning entry of a competition that was run on the Ideas platform last year, where the grand prize was to have your model turned into a gift with purchase. We can therefore expect it to be available later this year at shop.LEGO.com. Talking of GWPs, 40334 Avengers Tower will be the GWP later this month, from 19th April to 2nd May, with a spend of $75 on Super Heroes sets. Thanks to JZintel for the news. Benny approves--and so do I! Pretty cool! I wish the winner had been classic-space themed, but this is great! Hopefully this is given as a free gift with the purchase of the next theme park ride! Oooh, this looks great! The first GWP I’ve been excited about for a while. That contest was so long ago. I'd pretty much forgotten this was coming. I think I may have the original build instructions somewhere. Off to the laptop. Are those little yellow stars clikits? The little stars aren't Clikits, just Huwbot has gotten to you. They have been a Friends piece since around the beginning of them theme. I like it, I won't how much you need to spend. I just bought a bunch of clearance sets to get my little chick minifigure. Nice display set, will bricklink it for sure! I heard it was a knockoff? Haha I know it won’t but still...not...bitter...about that. This whole set is an adventure and I’m packing my bags to JOIN IT! Do you really have to buy Super Heroes sets to get the Avengers Tower? That is annoying. I don't buy Super Heroes LEGO but I really do like that tower model. I love this! But as others have said, it'll probably take quite a sizable purchase for this GWP. ^ I actually prefer the smaller size of that original version. Easier to fit in with other stuff without looking too big. It looks a tad too gigantic to put in front of a store, unfortunately. Does anyone know if the Avengers Tower will be available in Europe? And during which period? My cat is so excited for this he just puked on the laptop. I'm pretty excited too, but not about typing on this defiled computer. TOTALLY WANT IT!!!!!!!!!!!!!!!!!!!! !!!!!!!!!!!!!!! !!!!!!!!!!!!!!!! !!!!!!!!!!!!!!!!! This might be my first Ideas set! But why doesn't this one have the number just because it's a promo? Anyone have an idea on the price? I really cant wait for it to come to North America!! !